In a JustSecurity post reviewing the same speech that I observed ignored US failures to prevent violent extremism, NYU Professor Samuel Rascoff defends the US use of counterterrorism stings, even in spite of the details revealed by HRW’s report on all the problems related to them. David Cole has an excellent response, which deals with many of the problems with Rascoff’s argument. I’d like to dispute a more narrow point Rascoff made when he suggested that, because we have so many fewer trained militants than the Europeans, we “can afford” the “luxury” of stings. There are now approximately 3,000 European passport holders fighting in Syria and Iraq. In the time that it took Najibullah Zazi to drive from Denver to New York, a fighter could drive from Aleppo to Budapest. What that means is that European officials are relatively more consumed than American counterparts in keeping up with, and tabs on, trained militants. Orchestrating American-style sting operations is, in a sense, a luxury they cannot afford. The claim is astonishing on its face, in that it suggests that, because we don’t have real militants like Europe does, we should engage in the “luxury” of entrapping confused young Muslim men and sending them to expensive decades-long prison terms. Think a bit more about that notion of “luxury” and the financial choices we make on law enforcement. Here are some numbers taken from two sources: the HRW report (I basically searched on the dollar sign, though this doesn’t include every mention of dollars) and today’s Treasury settlement with Bank of America for helping 10 drug kingpins launder their money over a four year period, three years of which constituted “egregious” behavior. First, HRW reports that FBI spends over $1.3 billion a year on counterterrorism, much of it stings, leaving less than $2 billion for all other investigations. More than 40 percent of the FBI’s operating budget of $3.3 billion is now devoted to counterterrorism. That allows the FBI to pay some of its informants and experts hefty sums. Beginning in August 2006, the FBI paid Omar $1,500 per week during the investigation. Omar received a total of $240,000 from the FBI. This included: $183,500 in payment unrelated to expenses, and $54,000 for expenses incurred during the investigation including car repair and rent. These informants sometimes promise — but don’t deliver — similar hefty sums to the guys they’re trying to entrap. Forty-five-year-old James Cromitie was struggling to make ends meet when, in 2009, FBI informant Hussain offered him as much as $250,000 to carry out a plot which Hussain—who also went by “Maqsood”—had constructed on his own. The informant proposed to lend Hossain $50,000 in cash so long as he paid him back $2,000 monthly until he had paid back $45,000. Which is particularly important because many of these guys are quite poor (and couldn’t even afford to commit the crimes they’re accused of). At the time he was in contact with the informant and the undercover [agent] he was living at home with his parents in Ashland and he didn’t have a car, he didn’t have any money and he didn’t have a driver’s license because he owed $100 and he didn’t have $100 to pay off the fine. In various parts of the investigation he didn’t have a laptop and he didn’t have a cellphone. At one point the informant gave him a cell phone. And some of these crimes (the very notable exceptions in the HRW report include two material support cases, both of which are close calls on charity designations, but which involved very large sums, $13 million a year in the case of Holy Land Foundation) involve relatively minscule sums. According to the prosecution, Mirza was the ringleader in collecting around $1,000—provided by the FBI agents and co-defendant Williams—that he handed to a middleman with the intent that it go to families of Taliban fighters. So one theme of the HRW report is we’re spending huge amounts entrapping what are often poor young men in miniscule crimes so taxpayers can pay $29,000 a year to keep them incarcerated for decades. These are the stakes for what Rascoff calls a “luxury.” At a time of self-imposed austerity, these stings are, indeed, a luxury. Compare that to what happens to Bank of America, which engaged in “egregious” violations of bank reporting requirements for three years (and non-egregious ones for a fourth), thereby helping 10 drug kingpins launder their money. No one will go to jail. Bank of America doesn’t even have to admit wrong-doing. Instead, it will have to pay a $16.5 million fine, or just 0.14% of its net income last year. This settlement came out of a Treasury investigation, not an FBI one. But when DOJ’s Inspector General investigated what FBI did when it was given $196 million between 2009 and 2011 to investigate (penny ante) mortgage fraud, FBI’s focus on the issue actually decreased (and DOJ lied about its results). When FBI decided to try to investigate mortgage fraud proactively by using undercover operations, like it does terrorism and drugs, its agents just couldn’t figure out how to do so (in many cases Agents were never told of the effort), so the effort was dropped. 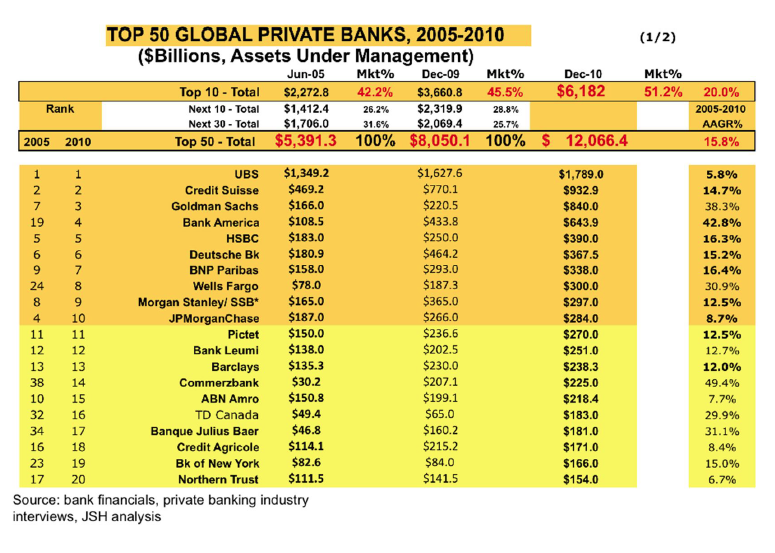 Banks commits crimes on a far grander scale than most of these sting targets. But FBI throws the big money at its counterterrorism stings, and not the banks leaching our economy of its vitality. Rascoff accuses HRW’s and similar interventions of being one-dimensional. [F]or all the important questions about official practices that critics raise, they have tended to ignore some hard questions about the use of stings and the tradeoffs they entail.Instead, their interventions have an exaggerated, one-dimensional quality to them. But he himself is guilty of his own crime. Because every kid the FBI entraps in a $240,000 sting may represent an actual completed bank crime that will never be investigated. It represents an opportunity cost. The choice is not just sting or no sting or (more accurately, as David Cole points out) sting or community outreach and cooperation. Rather, the choice is also between manufacturing crimes to achieve counterterrorism numbers or investigating real financial crimes that are devastating communities. So long as we fail to see that tradeoff, we fail to address one major source of the economic malaise that fuels other crimes. Ignoring bank crimes is, truly, something we don’t have the luxury of doing. Nevertheless, we continue to choose to go on doing so, even while engaging in these “luxurious” counterterrorism stings that accomplish so little. As I noted earlier, the Tax Justice Network just released a study showing that there is somewhere between $21 and 32$ Trillion that tax cheats have hidden in tax havens. Really obscenely rich people like Mitt Romney make up for $9.8 trillion of that–or about 18% of the total liquid net worth in the world, hidden away in tax havens. But there are two other tables from the study that bear notice. The study suggests that the money stashed in tax havens has been growing steadily at a rate of 16% a year. 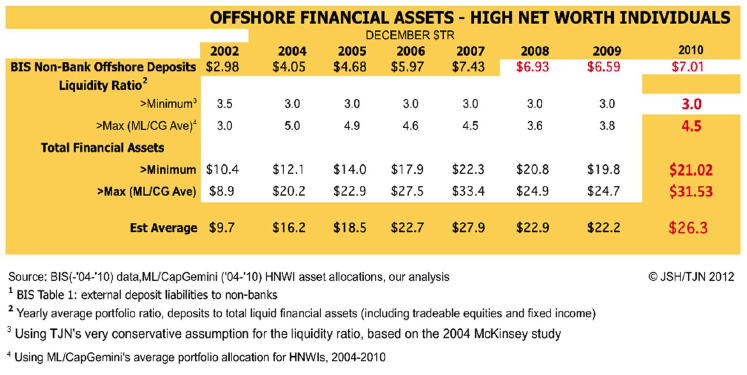 Our analysis finds that at the end of 2010 the Top 50 private banks alone collectively managed more than $12.1 trillion in cross-­‐border invested assets for private clients, including their trusts and foundations. This is up from $5.4 trillion in 2005, representing an average annual growth rate of more than 16%. But that’s sort of misleading. As the table above makes clear, the amount in tax havens grew by 67% between 2002 and 2004, then grew by 40% in the following two years, then by another 23% in the last year of the bubble. Then it crashed, basically losing that 23% and plateauing for a year. And then it started growing again, 18% between 2009 and 2010. And who knows how much in the last year? The banksters paid a price for 2 years, but the looting has begun again. 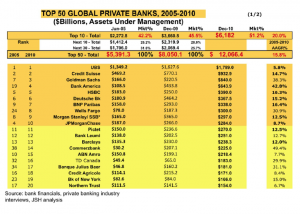 What I find particularly interesting–though I’m not sure what to make of it–is the changing share of looter service the big banks are doing. While UBS’ tax shelter dollars continued to grow, they lost market share among tax cheats. Meanwhile Goldman Sachs’ tax shelter dollars almost quadrupled in that time. Bank of America and Wells Fargo made big gains too (though Morgan Stanley’s tax cheat business shrank and JP Morgan’s was somewhat flat. Like I said, I don’t know what to make of it. But it sure seems like since the crash at least some of the banks have decided to recover by catering to tax cheats. Lovely. Some of the same banks that are still in business because tax payers bailed them out are increasingly some of the biggest players in facilitating the looting of our own–and every other–country. Update: This Title was changed. 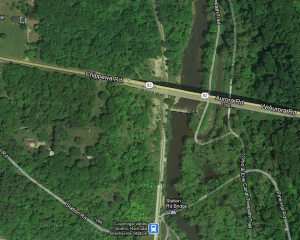 If “Anarchists” Threaten to Blow Up a Little-Used Bridge Over Federal Property, Is It a Plot? The bridge on 82 in this picture is the bridge a bunch of purported “anarchists” have just been arrested for threatening to blow up. You’ll note the idyllic parklands through which it travels You’ll note the presence of two bridges in the immediate vicinity (not to mention the major freeway bridges not far away), to which traffic could easily be diverted if an attack succeeded. You’ll notice the almost complete lack of traffic on the bridge, at least when Google took its satellite picture. In short, it makes zero sense for anyone to want to target the bridge. It would have almost no visibility. It would do almost nothing to disrupt traffic. It would be, at best, an expensive curiosity. It makes a far more implausible target for terrorists than the one the alleged plotters originally considered: bank signs in downtown Cleveland. The signs would have visibility. They would strike at a logical anarchist target. It would create news. The bridge, on the other hand, has just two advantages. First, as the affidavit notes, the bridge “has support columns within the boundaries of the National Park” and also (being not that far from the PA border) occasionally has cars with out of state plates drive over it. Those things–in spite of this being a little-used bridge on a state road–make blowing the bridge up interstate commerce, something the FBI can pursue. And, the bridge, unlike some signs, would require an explosive like C4 to bring down. So well before you get to the parts where a paid informant was offering to find money to get the C4 that the plotters said would otherwise be too expensive, you really have to wonder what purpose this plot serves. Besides to give the FBI something to point to on May Day to justify arresting peaceful protestors. https://www.emptywheel.net/wp-content/uploads/2016/07/Logo-Web.png 0 0 emptywheel https://www.emptywheel.net/wp-content/uploads/2016/07/Logo-Web.png emptywheel2012-05-01 14:08:052012-05-01 14:17:29If "Anarchists" Threaten to Blow Up a Little-Used Bridge Over Federal Property, Is It a Plot? Here are three data points that will make you cranky. It just closed under $5 for the day. 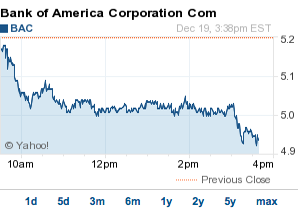 You see, you might look at the impending demise of BAC and wonder why its banksters merit any bonus this year. You might argue that awarding any bonuses amounted to looting what was left of the company the banksters had already almost finished looting. Two MI County Registers of Deeds–Curtis Hertel of Ingham (Lansing’s county) and Nancy Hutchins of Branch–have filed a class action suit against MERS, seeking the taxes the banks should have been paying to counties and the state every time they transfer property, plus penalties. Plaintiffs are seeking money and punitive damages, tax penalties, costs, and attorney fees in the return of unpaid taxes, interest and penalties to Plaintiffs as class representatives of the 83 counties of the State of Michigan. In addition to MERS, BoA, Chase, Wells Fargo, and Citi, the suit cites parts of the state’s biggest foreclosure mills, eTITLE, 1st Choice Title, and Attorney’s Title and Fannie Mae. The suit argues that the defendants had a duty to record the real value of property transferred in the state, and by failing to do so, they cheated counties out of the taxes on those property transfers. Defendants, as grantors, makers, executors, issuers and deliverers of deeds or instruments conveying an interest in real property under MCL 207.507, had a DUTY to declare the true value of the property and full consideration given/received on the face of each and every property transfer documents in Exhibit 2, as well as all those other similar filings made by Defendants; or in the alternative Defendants had a DUTY to attach an affidavit to the deeds and instruments stating the true value of the property. Defendants had these same DUTIES with regard to all those other deeds and instruments filed by them in all 83 counties of the State of Michigan over the last 15 years. Defendants made, executed, issued and/or delivered for recording with the Registers of Deeds in all 83 counties in Michigan, assignments and other real property transfer documents transferring all or part of an interest in real property without stating the actual and true value of the property on the face of the instrument; and without alternatively attaching an affidavit stating the true value of the property interest being transferred. MCL 207.504/MCL207.525(2). As a direct consequence of Defendants’ failure to properly make, execute, issue, and/or deliver real property transfer deeds, assignments, and other documents recorded in the 83 counties of the State of Michigan transferring property and security interests, neither County nor State Real Estate Transfer Taxes have been paid on thousands of real property transfers filed by/for Defendants across the counties of the State of Michigan as required by law. When Hutchins filed a similar suit covering just Branch County–a rural county with a population of 45,000–in August, she estimated the county had lost $100,000 in the last 5-10 years. Even in Ingham County alone, with its population of over 250,000, that number is going to be much higher. Add in the state taxes, and the money will start to add up. But the principle will be even more important: the banks have been cheating counties and states with this MERS scheme. It’s time they finally paid taxes like the rest of us. It took until Richard Blumenthal’s turn in Eric Holder’s appearance before the Senate Judiciary Committee today before Holder got asked about foreclosure fraud. Blumenthal generously suggested that, “I know the foreclosure crisis is on your agenda,” and then asked if we’ll ever see a prosecution on robosigning and other fraud. Holder responded, at first, by pointing to states Attorney Generals, claiming they are conducting investigations. I do hope he’s thinking of Eric Schneiderman, Beau Biden, and Catherine Cortez Masto, because the ones working on the settlement are pointedly avoiding any real investigation. Holder then further dodged, suggesting DOJ might find other ways–like civil suits–to hold these banks accountable. Finally, and perhaps most interesting, Bluementhal asked why DOJ had not intervened in the Bibby, Donnelly v. Wells Fargo suit, a whistleblower suit against Wells Fargo, BoA, Chase, Ally, and others for the illegal legal fees the banks charged homeowners, including veterans. Holder hedged in response to that question, promising he’d find out who had made the decision not to intervene and the basis for the decision. Unfortunately, Blumenthal pointedly avoided asking for a 30 day response to that request. So an explanation for why DOJ isn’t helping to sue banks for the illegal fees they’ve charged will probably come long after DOJ settles for those illegal fees. Yesterday, I described how the Obama Administration was going to charge the banks just $8 billion for immunity from a whole new swath of crimes. Shahien Nasiripour has more details which make the deal look even shittier. First, the proposed deal does appear to provide states immunity not just from robo-signing and the lies banksters made at origination, but also for their securitization errors. In return for getting the banks to agree to the refinancing scheme and give up higher interest income, the states would release the banks from civil claims related to loan originations, the stage at which many homeowners say they were duped by unscrupulous lenders. Last month, state prosecutors proposed to effectively release the five big lenders from legal liability for allegedly wrongful securitisation practices related to the banks’ treatment of loan documents. Taken together, the release from liability over poor origination, securitisation, servicing and foreclosure practices could amount to an effective grant of immunity for the banks from civil claims, people familiar with the matter said. And in exchange, the banks would pay 80% of their $25 billion penalty into a fund that the same people who botched HAMP would use to help just 1.36% of homeowners who are underwater on their homes. About 150,000 borrowers could benefit from the refinancings, as the vast majority of US home loans are owned by investors and government-controlled mortgage giants Fannie Mae and Freddie Mac. By comparison, nearly 11m US borrowers are underwater, according to CoreLogic, a data provider. The average underwater homeowner owes $258,000 on his mortgage. In other words, all the settlement would do is help those who crashed our economy stay in business. The vast majority of their victims–and the US economy–would continue to pay the price for their crimes. My mom’s pretty stubborn (I come by it naturally). So in spite of the fact that I have been warning her to move her primary banking out of Bank of America into a solvent bank for over a year, she has yet to do so. Which is why I’m so troubled that Bank of America is about to use my mom’s savings to back its derivatives counterparties. Money’s fungible, right? That’s what the anti-choice people say, anyway. So what’s the big deal that BoA has taken Merrill Lynch’s exposure to the European mess and put that risk where mom keeps her retirement? Yves Smith explains. First, this will make it all-but-impossible to unwind Bank of America when it goes under without disrupting the personal accounts of people like my mom. Significantly, if those derivatives pay off (for example, if Greece defaults) or require more collateral (because BoA gets downgraded again), then counterparties would get their money before mom does. As Yves points out, this will quickly result in the depletion of FDIC’s deposit insurance to pay my mom back for the money the banksters snatched. She suggests that Congress will quickly vote to fund the Treasury so it can pay my mom–and millions of other Americans–to replace their insured funds. She’s probably right that even the most Do-Nothing Congress in American history will eventually fund Treasury. I’m just not convinced it’ll happen quickly, or without some really big hostages demanded, first. Now, mom’s in pretty decent shape for a retiree–between some pensions and other retirement funds, she could wait out the Do-Nothing Congress. And heck, I’m even willing to lend mom a few bob, even if she is so stubborn. But most Americans are living paycheck to paycheck, and millions of them depend on what they’ve got deposited in Bank of America. It seems to me that Ben Bernanke has just unilaterally decided to make those BoA depositers lend banksters their life savings until such time as the Do-Nothing Congress gets around to fixing what are, as we speak, foreseeable and unacceptable consequences of this move. Update: Jeebus I had a lot of typos in this. I hope I’ve gotten them all.